As full implementation of the Affordable Care Act draws nearer, advocates and policymakers across Colorado are hard at work developing plans for the state’s new Health Benefits Exchange. 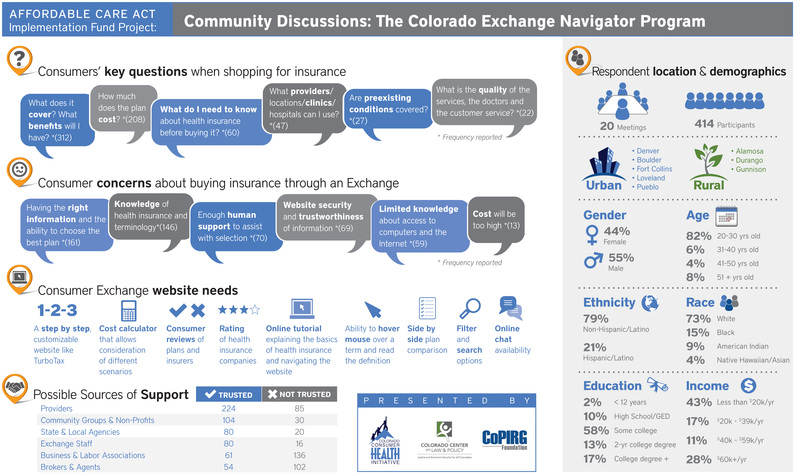 Michael Booth at the Denver Post takes a look at the results of recent community forums that asked consumers what features or qualities are important to them in a tool that is supposed to help them understand their options and choose a health insurance plan. Click on the image at left to see the infographic larger. Is your insurance unaffordable? Have your rates increased unreasonably? Tell us about it! The Colorado Consumer Health Initiative, an advocacy organization that works for barrier-free access to quality healthcare, wants to hear your story. We are building a storybank – a collection of real peoples’ experiences with the healthcare system – so that we can better inform the media, elected officials, and our fellow Coloradans about important issues. We want to help you make your voice heard. Click here to share your story! On Tuesday, January 22, 12:00 – 1:30pm MST, health care providers and administrators are invited to a webinar hosted by the National Wraparound Initiative: Using Medicaid Health Homes with Wraparound to Serve Youth Populations with Complex Behavioral Health Needs. Click to register. This webinar will provide an overview of the Medicaid Health Home provision of the Patient Protection and Affordable Care Act (PPACA) and its application to children with serious and complex behavioral health needs. Learn what administrative, workforce, and practice level strategies states can adopt within the Health Home model to implement a high quality wraparound and intensive care coordination approach for these youths and their families. The 5th Annual Jewish Disabilities Awareness Day and Family Resource Fair, Finding Ability in Disability: Promoting Understanding and Inclusion, is on Sunday, January 27, 2:00 – 5:00pm at the Elaine Wolf Theatre and the Robert E. Loup Jewish Community Center, 350 South Dahlia Street in Denver. Free and open to the public. PEAK Parent Center’s Conference on Inclusive Education is coming up, February 7-8, at the DoubleTree by Hilton Denver. Parents, teachers, special educators, school administrators and other school professionals will all find something of interest in the speakers, workshops, and break-out sessions. There’s still time to register, but hurry, since the event may sell out! Firefly Autism is having an intensive Social Skills Camp for children with Autism from March 25-29. We want to get the word out and would appreciate your support in letting your families know, and the Autism Community at large. Please refer any questions to Jenny Blankenship, Director of Outreach & Social Skills Services, at jblankenship@fireflyautism.org (303-759-1192, x12).